We all need to watch what we eat now and again - but healthy eating doesn't need to mean giving up on the meals that we like the most! In Superhealthy Suppers, the team at Good Food magazine have compiled a collection of their favourite dishes to help keep your body and mind in prime condition. From simple recipes for weeknight suppers, ready in under 30 minutes, to brilliant ideas for entertaining and even guilt-free desserts, this handy cookbook will give you delicious, healthy recipes all year round. 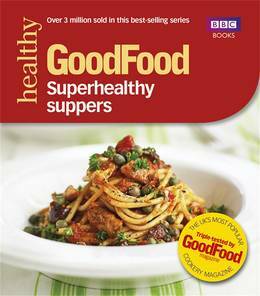 The Good Food team's stringent 'superhealthy' standards mean that every dish in this book is low in salt and saturated fat, and must also adhere to at least one of the following golden rules: a recipe must provide one-third of your daily requirement of fibre, iron, calcium, folic acid and/or vitamin C, or must contain at least one portion of your 5-a-day fruit and veg. Triple-tested and accompanied by a photograph of the finished dish, each recipe comes with a full nutritional breakdown and the seal of approval from Good Food, the UK's favourite cookery magazine. Healthy eating has never been so easy!